We had such fun in this week's classes making our own alcohol ink designs. Hats off to both Art Gallery of Viera classes, my SOS stamp club and the Titusville Public Library stampers! You were up to the challenge and we had a wonderful time together. Just what we needed after Irma!!!! You just need isopropyl alcohol and reinkiers in your choice of 2 or 3 colors, large cotton balls and glossy white cardstock. We used Pacific Point, Emerald Envy and Silver. I would suggest plastic gloves too. Just put alcohol on a large cotton ball, add 1 drop of each color and then just pounce, swoosh or swirl onto glossy white paper. 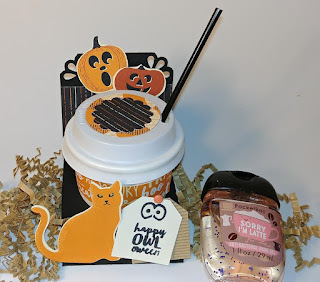 So quick, easy and fun and everyone's design is different!! 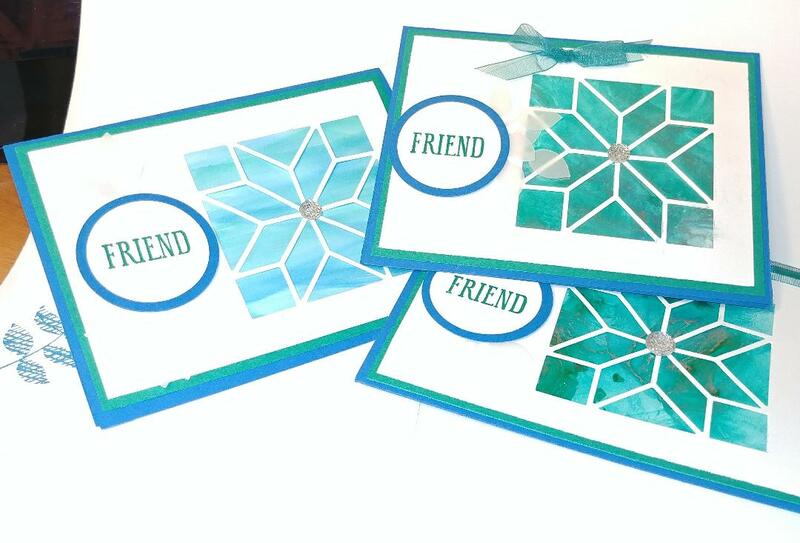 We used the leaf punch on the inside of the card and cut out little squares of our practice paper and those look great too! We used a Christmas Quilt Bundle framelit for our window. Perfect!! Here is this week's Christmas card. You might recognize the front from the Holiday Occasions catalog! 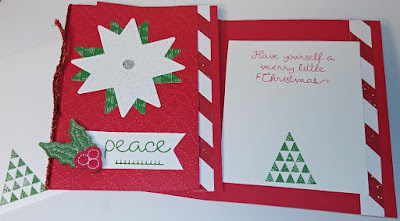 We used the Christmas Quilt embossing folder on the Real Red card front. Love those felt embellishments!!! Join my team and you'll receive this special gift made by me for you and an extra $40 gift certificate from me. So that's a total of $165 in merchandise for $99. Just go to http://www.reenathan.stampinup.net and click on "Join the Fun!" Have a fun and happy stampin' week! !